Eschew the tourist crowds and head to North Head Sanctuary and Norah Head Lighthouse. Change things up with these side-trips from Sydney: Sea Cliff Bridge (in Coalcliff), Bald Hill Lookout (in Stanwell Tops) and Wollongong (Science Space & Wollongong To Thirroul Bike Track). 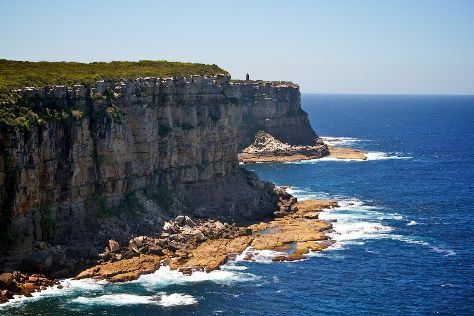 And it doesn't end there: head outdoors with The Entrance Pelican Feed, enjoy the sea views from Barrenjoey Lighthouse, tour the pleasant surroundings at McKillop Park, and look for all kinds of wild species at Blues Point Reserve. Atlanta, USA to Sydney is an approximately 23.5-hour flight. You can also do a combination of flight and bus; or do a combination of flight and train. Due to the time zone difference, you'll lose 15 hours traveling from Atlanta to Sydney. Plan for little chillier temperatures traveling from Atlanta in May, with highs in Sydney at 70°F and lows at 54°F. Finish your sightseeing early on the 27th (Mon) to allow enough time to travel to Melbourne. On the 28th (Tue), relax and rejuvenate at some of the top local wellness centers, admire the natural beauty at Wilson Botanic Park, do a tasting at Corniola Wines, then learn about winemaking at Yileena Park, and finally get to know the fascinating history of Lilydale to Warburton Rail Trail. On your second day here, contemplate the waterfront views at Lilydale Lake, learn about winemaking at Badger's Brook Winery, then admire the masterpieces at TarraWarra Museum of Art, and finally take in nature's colorful creations at Alowyn Gardens. To find ratings, more things to do, photos, and more tourist information, refer to the Melbourne online trip builder . You can fly from Sydney to Melbourne in 3.5 hours. Alternatively, you can do a combination of flight and shuttle; or drive. Expect slightly colder temperatures when traveling from Sydney in May; daily highs in Melbourne reach 63°F and lows reach 46°F. Finish your sightseeing early on the 29th (Wed) to allow enough time to travel to Brisbane. Start off your visit on the 30th (Thu): contemplate the long history of Boggo Road Gaol, test your team's savvy at popular escape rooms, explore the world behind art at Queensland Art Gallery, get lost in a book at State Library Of Queensland, then appreciate the history behind Bee Gees Way, and finally get your game on at Circus Arts. Get ready for a full day of sightseeing on the next day: learn the secrets of beer at a beer tour and tasting. For reviews, photos, traveler tips, and tourist information, read our Brisbane day trip site . Traveling by flight from Melbourne to Brisbane takes 4.5 hours. Alternatively, you can do a combination of flight and bus; or drive. Expect a bit warmer temperatures when traveling from Melbourne in May; daily highs in Brisbane reach 74°F and lows reach 56°F. Finish up your sightseeing early on the 31st (Fri) so you can travel back home.